Korean empress Queen Min was assassinated in the early hours of October 8, 1895, at Okho-ru (옥호루, 玉壺樓) Pavilion in the Geoncheonggung (건청궁, 乾淸宮), which was the rear private royal residence inside Gyeongbokgung Palace. After verifying that they had indeed killed Queen Min, the assassins burned her body. The Eulmi Incident (을미사변; 乙未事變), the name given for the assassination, constitutes one of the most tragic events in Korean history. Both the Korean and Japanese governments accept that the incident involved the Japanese consul to Korea, Miura Gorō, but some propose that the Japanese government instigated the assassination. The course of Korean history took a tragic turn toward disaster with her murder, triggering the Donghak Peasant Revolution, First Sino-Japanese War, Russo-Japanese War, and the Japanese colonization of Korea. Scholars generally agree that Miura Goro, the Japanese minister to Korea, commissioned assassins to murder the Empress Myeongseong in her residence in Gyeongbokgung on October 8, 1895. The Japanese government had viewed her as an obstacle to their designs on Korea. Japanese efforts to remove her from power had failed due to Gojong's devotion to her. The Japanese sent ambassadors to Korea's royal court in an unsuccessful attempt to have her removed. As a result, the Japanese minister to Korea, Miura Goro, faced with losing Korea to other foreign powers, hired Japanese men to invade the Korean imperial residence and assassinate the empress in 1895. They killed three women suspected of being Queen Min. After verifying the identity of the Queen, they burned her body. In May 2005, 84-year old Tatsumi Kawano (川野 龍巳), the grandson of Kunitomo Shigeaki, paid his respects to Queen Min at her tomb in Namyangju, Gyeonggi, South Korea. He apologized to her tomb for his grandfather's role in the assassination. 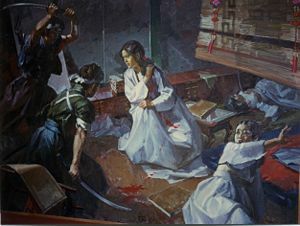 Artist's impression of Queen Min's assassination in her quarters. In 2005, professor Kim Rekho (김려춘; 金麗春) of the Russian Academy of Sciences discovered a written account of the incident by a Russian civilian, Aleksey Seredin-Sabatin (Алексей Середин-Cабатин), in the Archive of Foreign Policy of the Russian Empire (Архив внешней политики Российской империи; AVPRI). Seredin-Sabatin served the Korean government, working under the American general William McEntyre Dye who worked under contract to the Korean government. In April, Kim made a request to the Myongji University (명지대학교; 明知大學校) Library LG Collection to make the document public. On May 11, 2005, the university made the document public. The courtyard where the queen's wing was located was filled with Japanese, perhaps as many as 20 or 25 men. They were dressed in peculiar gowns and were armed with sabres, some of which were openly visible...While some Japanese were rummaging around in every corner of the palace and in the various annexes, others burst into the queen's wing and threw themselves upon the women they found there...I...continued to observe the Japanese turning things inside out in the queen's wing. Two Japanese grabbed one of the court ladies, pulled her out of the house, and ran down the stairs dragging her along behind them ... Moreover one of the Japanese repeatedly asked me in English, "Where is the queen? Point the queen out to us! "...While passing by the main Throne Hall, I noticed that it was surrounded shoulder to shoulder by a wall of Japanese soldiers and officers, and Korean mandarins, but what was happening there was unknown to me. Japanese illustration of King Gojong and Queen Min receiving Inoue Kaoru. One source, the Ei-joh report, states that the Japanese consul gave the assassins a photograph of the Empress to find her in case she disguised herself in non-Empress attire. Other sources describe the photograph as an offical royal family portrait. A royal family photograph does exist, although taken after her death, consisting of Gojong, Sunjong, and the wife of Sunjong. Some believe that the Japanese destroyed all photographs of her after her death. An unsubstantiated report states that a photograph of the Empress exists in the Japanese archives but the Japanese government has allegedly denied its existence. KBS News reported in 2003 that a photograph allegedly of the Empress had been made public. The grandfather of Min Su-gyeong purportedly purchased the photograph, a family treasure, for an undisclosed sum of money. In the photo, a retinue followed the woman. The woman's clothing, only worn by the royal family, reflected high-rank, yet her outfit lacked the embroideries that decorates the apparel of the empress. On January 13, 2005, history professor Lee Tae-jin (이태진; 李泰鎭) of Seoul National University unveiled an illustration from an old Japanese magazine he had found at an antique bookstore in Tokyo. The 84th edition of the Japanese magazine Fūzokugahō (風俗畫報) published on January 25, 1895, has a Japanese illustration of King Gojong and Queen Min receiving Inoue Kaoru, the Japanese charge d'affaires. The illustration, marked December 24, 1894, and signed by the artist Ishizuka (石塚 ) with a legend "The [Korean] King and Queen, moved by our honest advice, realize the need for resolute reform for the first time." Lee stated that the photograph showed the clothing and scene background in fine detail. In the photo, shows Inoue conversing with the Queen with the King listening. ↑ Testimony of the Russian citizen Seredin-Sabatin, in the service of the Korean court, who was on duty the night of September 26 Columbia University, Aleksey Seredin-Sabatin, 1895. Retrieved December 15, 2007. This page was last modified on 12 August 2017, at 14:55.